2004 has been a year of many changes for our young family – some large, some small. In August, Casey graduated from the University of North Dakota with a Masters in Special Education! She was hired by the Grand Forks Public School District in the summer and is now working at West Elementary School as a specialist in learning disabilities and emotional disabilities. As with any new teacher, Casey has had plenty of learning experiences so far this year, but has found it very rewarding overall. Jason is still working for EduTech, a North Dakota state organization assisting K-12 schools with technology. He moved into a web development position in the summer of 2003, and is finding it very enjoyable and challenging. Jason is still working towards getting his masters in business administration degree from UND, taking one or two classes each semester. He expects to graduate with his MBA in the summer of 2005. We had a very eventful and memorable summer this year. On June 15th, we celebrated our second wedding anniversary. After Casey completed her classes in July, we took a week long road trip, spending time with family in Lacrosse, Wisconsin and Stevensville, Michigan. We also spent several days relaxing and having fun in the Wisconsin Dells. In late August and early September, we moved from our on campus apartment into an apartment on the main floor of a house near UND. Our new place feels more like home than our last, and we really appreciate the extra room we have now. We are still attending Grace Baptist Church in Grand Forks, where we have made many new friends. Our new pastor arrived in September, and we are really enjoying the messages he shares. We are also part of a Bible study for young married couples, where we have met many new friends. 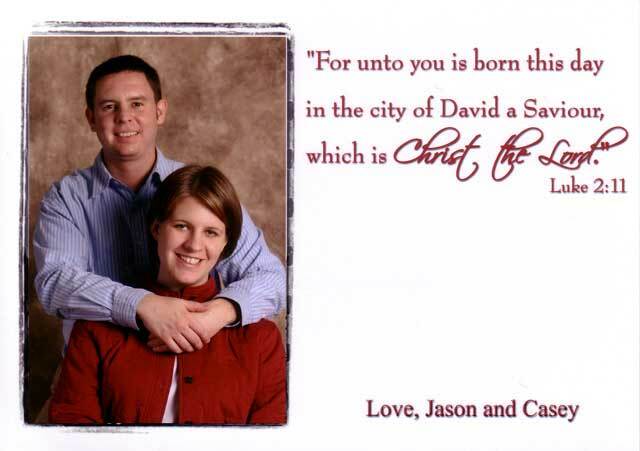 We hope all of you have a very blessed Christmas season and a very good 2005!